I have a bit of a problem. My Sunshine Infinity RDM mast broke. So I have bought a North Platinum Mast off a mate. Last year I bought the Fusion and they said it rigs best on a Neil Pryde mast. Only problem is I have a North X-Type 8.2m sail and a Sailworks Retro 6.5 - and North says they are both suitable for the Platinum mast. Only thing is, North says that their masts are unsuitable for the Neil Pryde. It seems that Neil Pryde are totally different sails to any other - and my new mast won't work - or won't work well on my $950 Neil Pryde Fusion. Don't know what to do. Either buy a second mast - Neil Pryde, that properly rigs on my Fusion. Sell the Fusion and get a North E-Type 7.2 to replace it. Your experience and advice/tips would be greatly appreciated. Grab a NP 430 X6 SDM mast. You will need a 48 extension with it if you don't have one. They go exceptionally well in that sail. The good news is you wont need that 8.2 sail at all. I use the 7.2 fusion as my biggest rig I own, on a Futura 111 and I can plane in the same wind all the bigger rigs do. The reason is the clew length at 211cm and the incredible bottom this sail has. You would be aware of that already I bet. You would also know the way it gently lifts the board on the the plane with very little effort. I found the 430 mast to be way better than the 460 even though they say it can have either. I don't own a 460 anymore as I don't need a bigger rig. I don't know how you decide what to rig in light wind as those 2 larger sails would be very similar. I weigh about 85 kgs, so unless you're a lot heavier you will get the same out the mast I do. My fins are 42.5 and 45 which I use in 10-16 knots <----may help to compare if you're newer to windsurfing. Thanks for the advice Ulf. I have a Starboard Go 144 and weigh about 90kgs. I am currently using a mate's severne code red mast 100% carbon. It did make a difference to the performance of the sail - responding to gusts and so on. I am at a loss for what to rig in lighter winds. Often when I sail the wind dies off a bit to 12-15 knots. I don't want a cambered sail and I don't know how large a sail to look at - or what would be effective. I am just wondering what I am missing out on. I am using a 47cm S-Ride fin at the moment. Nearly all the freeriders use RAF sails ( no cams ). Even Sean O'Brien uses a Severne NCX when not training for PWA. A lot of windsurfers are into GPS speed sailing hence why there are so many Cammed rigs around. They like to be the fastest. I don't know anything about the other brands like North etc. as I've only owned NP since 1995. Hopefully someone else can help with your North. 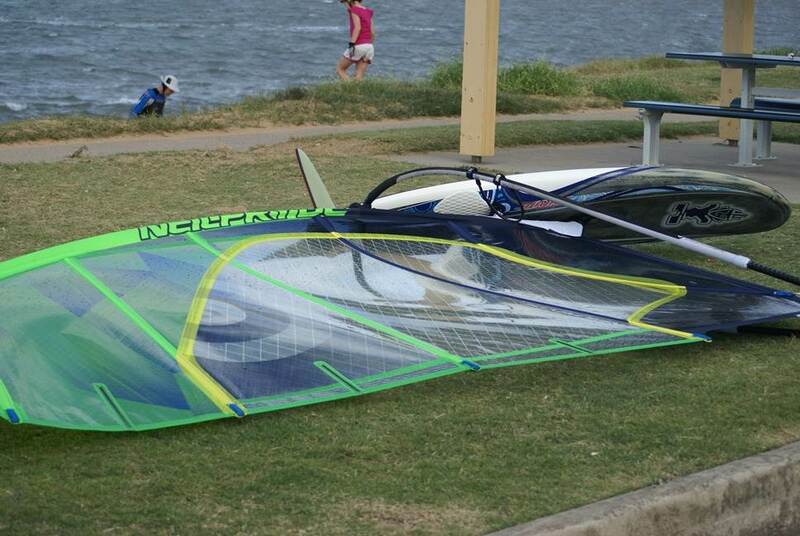 The Go 144 is quite a detuned board so you wont be getting into to much trouble in the lighter wind. Your Fusion is a perfect light wind sail in 7.2 for QLD on that board. You won't plane until you have a solid 13 knot gust with either the 8.2 or the 7.2 then you should keep it planning down to about 11 knots when already planning. The fin is a good size for the G144 will help in the light stuff. Could go smaller 38/40cm as you get more efficient or it is a solid 15-16 knot breeze. I was 90kgs last year so you will be fine with the 7.2 and you really do not need anything bigger. Remember the fusion 7.2 has the same power as 7.8 -8.2 sails and is a lot lot easier. What is the boom measurement on your 8.2 ? When comparing a board you need to know the width and 30 cm measurement at the tail, and sails the boom length and luff gives you a good indication of what wind it will be best for. Some 5.5 sails have an incredible 8 cm difference in boom length. Don't worry to much about the different brands you have. Usually a light wind sail requires a 460 mast ( not the Fusion ). Typically 6.0. to 6.5 sails are on a 430 and 5.0 to 5.5 on 400 masts. So you will need more than one mast anyway. The important thing is have the right one. Since you already paid for a new Fusion get the right mast for it and it will last for years. You could sell the 8.2 or trade it in on the mast or another sail you need etc. If you decide you like the North 8.2 better then get the right mast for it. Most windsurfers get a feel for a brand and stick with it. The three I sail with at Redcliffe all have one brand in their kit. One is on Ezzy, another on Loft, and another on Neil Pryde. Thanks again, Ulf. The North X-Type boom length is 223cms, the luff is 509cms. My friend here at Port Douglas sails on North equipment and has used it for a long time, but I bought the Fusion before I met him. I am impressed with the quality of his equipment, but when I bought the Fusion they did advise me to get a Neil Pryde mast [which I didn't, because I already had the Sunshine mast]. So I guess I am still deciding which gear to use. I guess your advice about getting the right mast for my Fusion would be the way to go. I don't already have a 430cm mast and they are becoming increasingly popular these days. Thanks again for your time and the invaluable advice. Here is a pic of the Fusion 7.2 rigged with a X6 430 mast from yesterday in light wind. Hi Ulf, I came across the next best solution. I was at a BBQ for FirieBob on Saturday with the FNQMob and a guy there had an "as new" X6 460 mast that he didn't need. One thing led to another and for a couple of hundred dollars I now have a Neil Pryde mast for my Neil Pryde sail. Thanks for posting the photo. It was a light breeze this afternoon up here at Port Douglas but I was keen to see how the combination worked and it rigged beautifully. Very much like your posted photo. Thanks heaps again for the advice, Ulf. I just love the generosity of the people who contribute to these Forums. I now have a great combo to keep me going for a very modest sum. Also a big thanks to Gaz from the FNQ Mob for the new mast. I just bought a second hand NP fusion 7.2m. Would you recommend a neil pryde X6 RDM as well?